Paragon Video has a posse. If there's another North American vintage video studio that primarily released product in "slipcover" boxes that's more desired by collectors--I'm unaware of it. Paragon was one the earliest companies specializing in horror, cult, and exploitation videos to enjoy on your sixty pound, remote-less VCR back at the dawn of the '80s. Nowadays, virtually everything in good condition that pops up on eBay from this long gone supplier is quickly snapped up. Like big box collectors, Paragon has its own slavish devotees who search for certain releases and want to build their collection with near mint/mint copies. 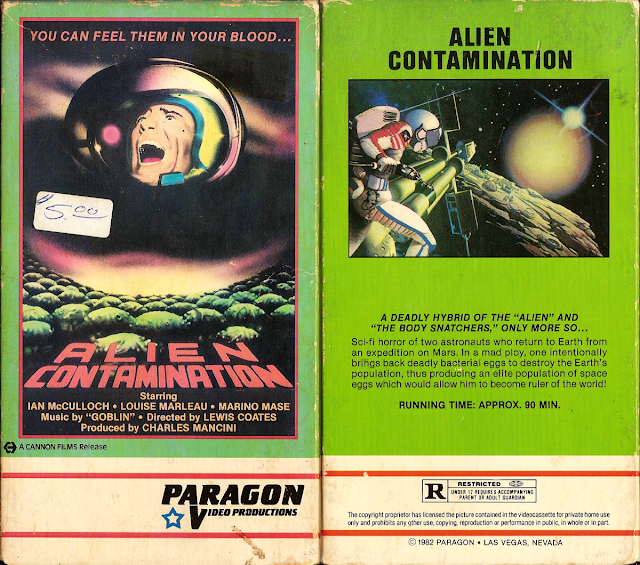 That said, this copy of Luigi Cozzi's Contamination (1980) from the outfit is in very rough shape. Although it is in better condition than I've seen other now twenty-eight-year-old copies in. While not always the case with Paragon, this release is scorn of eleven minutes of footage restored decades later in Blue Underground's fully uncut DVD. This one isn't much for watching given that, but it's cool regardless. As you can see some idiot stuck stickers on the cover. It's important to note that with cardboard-boxed tapes this ancient; any attempt to free these annoyances from the cover will result in irreversible tearing or "chipping" of the fragile paper. Best to leave it alone; even with the aid of Goo Gone or similar sticker-loosening liquid. The cassette itself, a Japanese-made FUJI T-105, feels like a brick in hand and still plays well despite being several years older than its expected lifespan. The artwork on the back of that cover has nothing to do with the movie though, thats kind of a sleazy move isn't it? Elvira showed this on her show once, and it was pretty much uncut with alll the gore.